We got some blueberries yesterday and decided to make blueberry pancakes for today’s family breakfast. I searched internet, and quickly settled on this recipe before I got distracted with tons and millions of pancake recipes out there. Well, after the testimony this morning I think I have indeed found good pancake recipe. Unlike other recipes that use whole eggs, this recipe calls for folding whipped egg whites into egg yolk mixture, and thus producing light and fluffy pancakes. 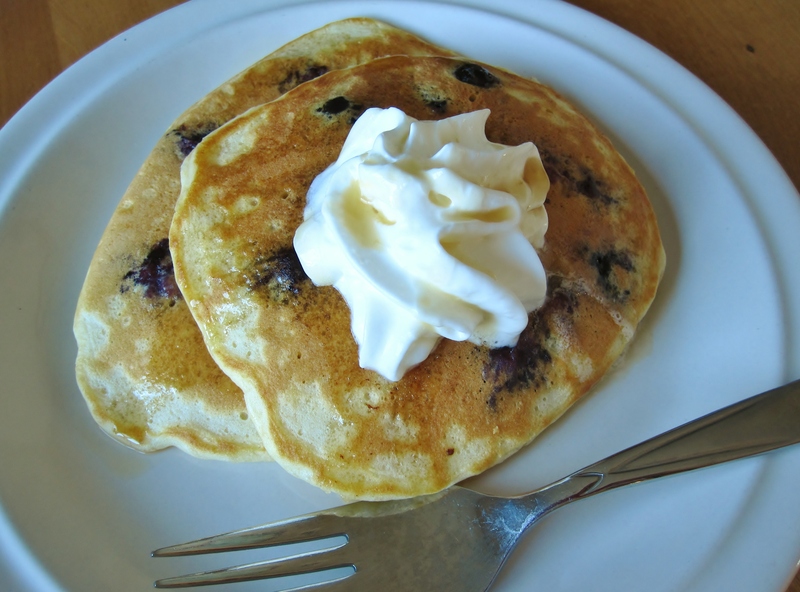 You can skip the blueberries for a plain version if you like. 12/5/10 update: I have increased ingredient portions to make 15 pancakes for my family as it wasn’t enough based on original version. The changes are written in bold blue color. Also, be sure to check out my notes below for some tips on made-ahead pancake batters. Sift flour, baking powder and salt into a medium bowl. In a separate small bowl, mix egg yolks, 1/2 cup (or 3/4 cup if making for 15 pancakes) of milk and melted butter with a hand whisk until smooth. Make a well in the center of the flour mixture. Pour yolk mixture all at once, and use the hand whisk to stir just until combined. Over mixing will make for tough pancakes. Beat egg whites until fluffy. Add in sugar and continue beating until soft peak appears as for meringue. Fold in 1/3 of whipped egg whites into yolk mixture using a spatula. Fold in remaining whipped egg whites into the batter. Add in remaining milk and blueberries. Continue folding until all blended. Cook on low heat as you would with other pancakes. Pancake and waffle batters made with baking powder can be made ahead and stored in the refrigerator overnight. Since the baking powder may lose some of its potency overnight, add a little extra. If the first pancake doesn’t rise enough, sift a little more over the batter and gently stir it in. Alternatively, you can add an extra 25 to 50% when you make up the batter. Pancake and waffle batters leavened with baking soda cannot be stored. The leavening go to work as soon as they are moistened and will lose their power overnight. If the recipe calls for baking powder and egg whites, you can mix the batter the night before but wait till morning to fold in the egg whites.